Now I did picked one a while but due to personal issues I wasn’t ready to sit down and go back down the rabbit hole. So I put it off till now, hopefully. The version that is up next was a suggested by neala897 and it’s the Roland Petit Ballet. We will see how this goes because ballets are hard to review. As of yet I have not watch the Ballet that will come later as I as fresh of perspective as possible. But here is a little background information. Petit mounted Notre Dame de Paris in 1965 with music by Maurice Jarre. Jarre was a film composer who did the music on films like Lawrence of Arabia (1962), Doctor Zhivago (1965) and Passage to India (1984.) I will just say one source site the ballet as debuting in 1965 and another sites 1967, the point is this ballet is from the 60s. So let’s get into this. 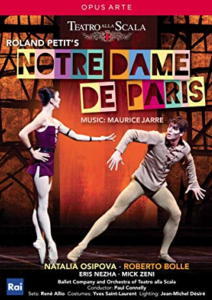 I’m going to watch the version performed by the Opéra national de Paris, 1996 with Isabelle Guérin as Esmeralda, Nicolas Le Riche as Quasimodo, Laurent Hilaire as Frollo and Manuel Legris as Phoebus. Who has seen this version or at least this ballet before?